Let’s share in the harvest! excess fruit and make it available to people in need. Backyard Harvests are held in the yards of Portland residents all over the city. Have a tree in your yard and don’t know what to do with all the excess fruit? Want to volunteer to harvest someone else’s tree, meet new friends, and take some delicious fruit home? Partner Harvests are private harvest events organized in partnership with local agencies helping underserved communities, or with local groups looking for a team-building experience. Want to donate your excess fruit but interested in harvesting the fruit yourself? 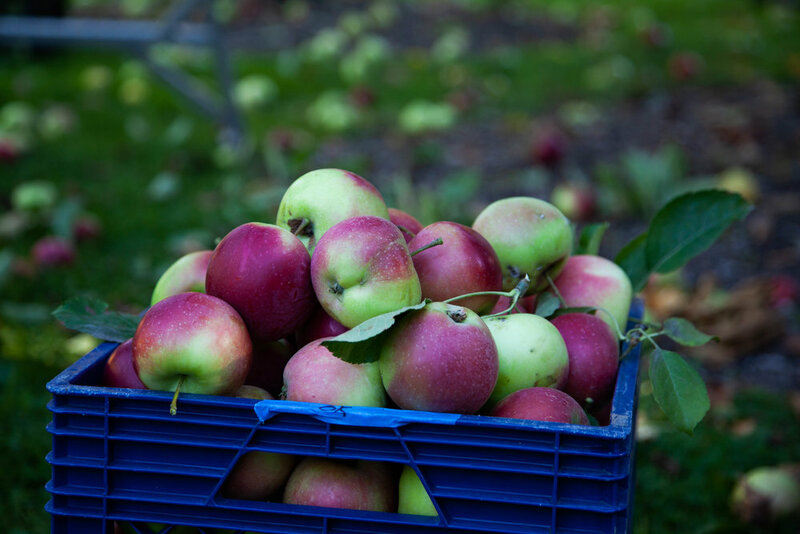 Harvest your tree, sort the fruit, then put excess fruit in cardboard boxes or bags on your front porch, and we’ll pick them up and take them to a local food bank! Download our guide to learn how to harvest and sort your fruit. Download our DIY Harvest Kit for information on harvesting, sorting, and distributing your excess fruit! Join our Share in the Harvest Facebook Group to find neighbors near you who have fruit they want to share! In celebration of this incredible specialty fruit, and in order to decrease the amount of persimmons that go to waste, the Portland Fruit Tree Project partnered with local restaurants and bakeries in Portland to share in the harvest of our locally-grown persimmons! In its first year as a pilot earned-income program, Project Persimmon partnered with 11 local food establishments, who used 525 pounds of our backyard-harvested persimmons in their recipes during the months of October and November. See below for a list of participating restaurants, and email us if you're interested in participating next year! Interested in learning more about ripening, harvesting, and tree care? Let's share in the harvest!